What if school became real life? I love this question. I wasn’t sure of the origin of it, until recently. However, in Will Richardson’s latest blog post, he attributes it to Chris Lehmann. Unfortunately, this is a question I had never considered, let alone had shape me, until four months ago. 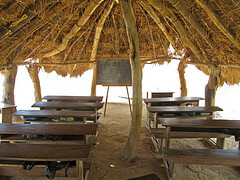 However, my answer to it, is that when school becomes real life I get to send one of my students to Uganda. And this summer, I actually do. Because of the large amount of money my students raised, during our participation in Schools for Schools, we have the opportunity to send one of our student’s to Uganda this summer, all expenses paid. During this time, the students going will see the schools that are being rebuilt, and meet the children whose lives it’s changing. They will talk with them, laugh with them, experience their culture, and be irrevocably changed. Amazing. As a teacher, it does not get much better than this. But we’ve candidly discussed that this is no holiday. Uganda is a dangerous place. And as much joy as there will be, sorrow will abound. She will see suffering, and suffer because of it. She will see brokenness and be broken because of it. She will see joy that has no explanation by western standards. She will have reason to question the western values she has taken for granted. She will not come back the same girl she left as. That’s what happens when school becomes real life. I do not believe this is an isolated circumstance in teaching. As teachers, we need more often to blur, if not completely erase, the lines between school and real life. Or create circumstances where their learning continues long after the class and assignments are over. To do things that matter. And while I likely won’t send a student to Uganda every year, I have plans for this type of learning to continue. With a new semester just around the corner, the question that is crafting all of my teaching, planning, and assignments, is what if school is real life? On the first day of next semester, and every semester after, I will ask my students, “Since we all have to be here anyway, why don’t we actually do something that changes us, our community, or makes the larger world around us a better place? Only twenty students are sent each summer to Uganda, and this year one of them is mine. That’s what happens when school becomes real life. Oh I’m sure it doesn’t originate with Chris Lehman. I said the same thing in 2001 (here: http://www.downes.ca/presentation/18 — ‘Online Learning: From Virtual to Reality’ ) and I’m sure it wasn’t unique to me. Edupundits have to stop thinking that these things ‘originated’ with other edupundits a few months ago. The sad thing is this: for students, school has always been the only “Real Life” they have known – mostly irrelevant, mostly boring. For a very large percentage of the students in this world, this is all they will ever know. This will be their Real Life. What you have done is taken them way beyond “Real Life” – to Life in the Great Big World. To Life that Matters. I hope your students realize how lucky they are. Thanks for commenting. Most of what I’ve learned so far has been by trial and error. But a good starting point might be Chris Watkins book, Classrooms as Learning Communities . I’ve also recently received this website from another reader, and it looks like a great starting point for learning about inquiry learning: http://bctf.ca/bctla/pub/index.html#points.